There is a blazer detail that’s emphasised this season – many versions with turned up collar. This one has a lovely change of texture by using a mesh overlay except in the collar and ‘lapel’ area. Including Eileen Fisher’s featured jacket this season. Oddly there’s no photo on the Eileen Fisher site which shows the collar clearly. 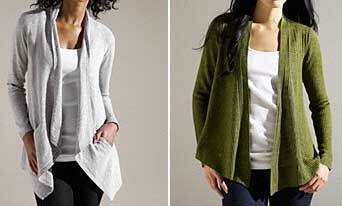 (For a softer look, Eileen Fisher also has several jackets with a cascade/ waterfall front. Though in leather I think they look assertively edgy rather than soft. See my post on new patterns for soft and shapely jackets.). A turned up collar is a possible style for both business and a more casual look. Could work well in a setting which needs a more professional look but with a bit of fashion forward edge. 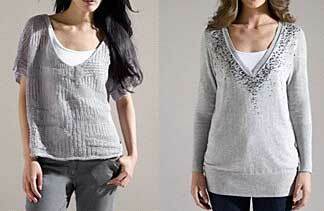 Easy to mimic using McCall’s 6711, which has a collar that can be made and worn either up or down. On the McCall’s pattern, the princess seams give easy opportunities for this season’s colour blocking or texture blocking. Or use leather just for the collar or for added trims, round the edges or in the princess seams. 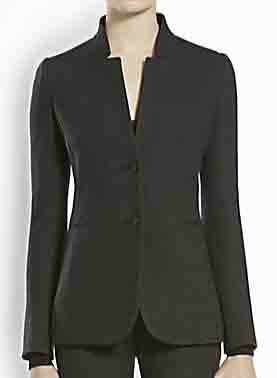 The Eileen Fisher jacket has leather piping in a waist seam. The McCall’s jacket is part of a wardrobe pattern, with a good variety for combining crisp and soft lines. Though as usual you have to check if the jacket will layer over other sleeves. Choose which way to make the jacket. If you press the collar and lapels to roll down and back, then turn up the collar, you may look just look as if you’re sheltering from a draft ! Make a version with collar pressed flat if you want to look sleek and in control with this turned up collar. Though of course the conventional blazer collar turned up and worn with a scarf is a classic casual look. Look closely and you’ll see this turned up collar may be made with a slightly wider neckline so the collar upper edge lies lower on the neck. Also the notch in the McCall’s pattern is wider than the notches in the RTW versions. 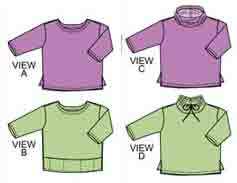 The pattern uses a collar which is easy to sew. 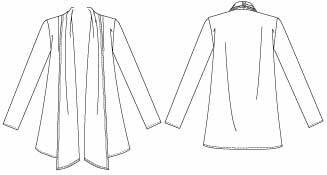 – when attaching the under-collar to jacket and upper-collar to facings, sew only to the ‘match point’, not into the seam allowance beyond it (tutorial here – after first 2 steps). – when joining body-under collar and upper collar-facing units, sew away from that match-point corner in both directions (tutorial here). Not many patterns with an inset collar. Here’s a few (these are just examples which have that collar in a corner, they’re not patterns for turned up collars) : Vogue 8845 by Claire Shaeffer, Vogue Wardrobe 8887, Burda 03/2010 # 116. Personally I wouldn’t look at all friendly with all those angles close to my face ! (though it would look better in light colours). Is this a style element that would look good on you, or is the crispness and this collar shape not best for your personal lines and the attitude you like to convey ? 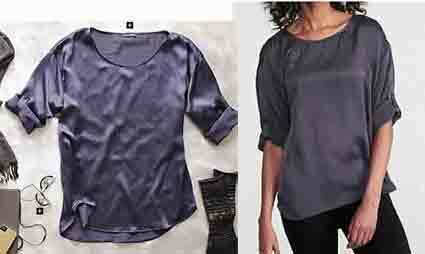 More casual partying clothes for the 2012 holiday period from Eileen Fisher’s Holiday Tool Kit. 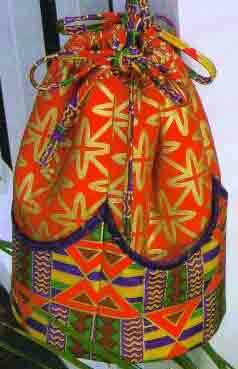 The folded red item is a simple dress. My previous post on this capsule was about patterns for the tops and pants. This is about patterns for the dresses, plus some of my own ideas for expanding these 6 items to a holiday travel wardrobe. There aren’t patterns to copy the dresses exactly, so they need a little pattern work. But again they’re mostly quite simple makes. 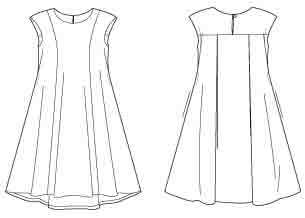 A loose shift dress shape with cap sleeves, rather than a fitted sheath, though it does taper slightly to the hem. Like the tops, that means it’s based on the casual dartless block. The neckline is like the popular DKNY knit, Vogue 1250. But that DKNY dress is rather fitted. The shape of the Eileen Fisher dress is more like this DKNY for wovens, Vogue 1300. So some pattern combining may be needed. Or you might prefer to lengthen this top for wovens, Vogue 8816. A low-thigh length overdress with flare and a shaped hem. 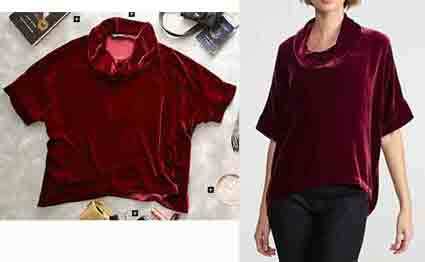 Made in velvet, with silk charmeuse for side panels and trim on neckline and armholes. The pattern is basically a v-necked a-line dress with shaped hem. Here’s a Fashion Star pattern, McCall’s 6553. It has seams for side panels, though they are much wider than the inspiration. 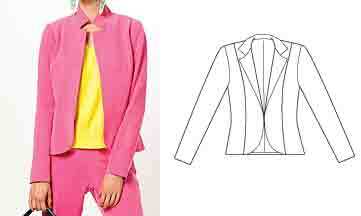 Alter the neck line and hem line shapes to copy the inspiration, or to what’s most flattering for you. Butterick 5655 View B is simpler. 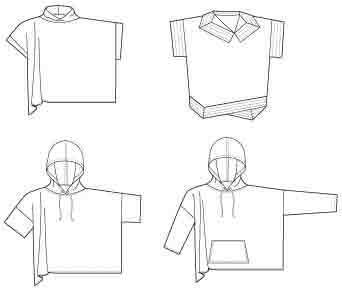 Use the outer-layer pattern pieces only, and change the neckline and length. Kwik Sew 3802 is for knits, and has another way of achieving an interesting hem shape. 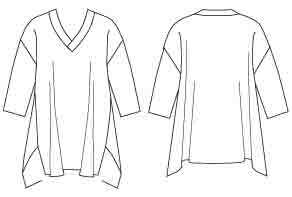 Omit the sleeves and change the neckline. The Eileen Fisher version is made in two fabrics, velvet with contrast shiny trim for neck and armhole edges and side panels. If you want this texture change you’ll have to make a pattern for adding the side strip from underarm to hem. Quite easy pattern work. Just draw a line on the pattern where you want the new seam, and remember to add seam allowances. 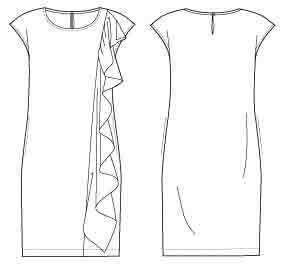 Combine the front and back side pieces into one pattern piece for a neater result. For many sewers the sewing is more difficult than the pattern making. Combining velvet and charmeuse is a bit of a challenge. So you might like a simpler fabric combination. It’s easiest to combine 2 of the same fabric type, just different in colour or print. 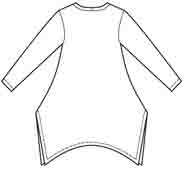 And remember this is an overdress, so you need a size larger than usual for a dress, to allow for comfortable layering. These 6 items – 2 dresses, 3 tops and pants – could make a good “dressy casual” party wardrobe capsule. Easy wear shapes, but in shines and velvets. See end of my previous post on this capsule for more fabric suggestions. For a complete holiday period travel wardrobe, I think you need to add some more fitted tops, to layer under the over-dress or give a different silhouette. 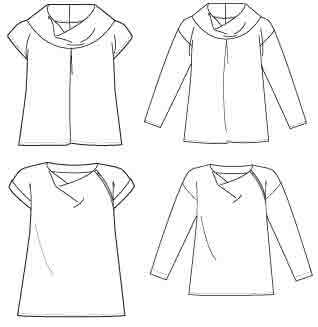 Or to layer under these over-sized tops if you need more warmth. Tees, blouses, shirts – keep up the quality with the fabrics. And more than one pair of pants. Plus a slim skirt of any length. Add a cardigan jacket if you want more layering options. McCall’s 6084 is a quick pattern for both wovens and knits which I’ve suggested for previous Eileen Fisher capsules. This gives a change of silhouette, it’s not wearable over those wide tops. Make it thigh length for a different look. There are many similar patterns in another of my posts on Eileen Fisher styles. For a heavier jacket : Eileen Fisher’s key jacket style for this season has a funnel neck. There are many patterns for these. Here’s one with very dropped shoulders, Very Easy Vogue 8539. Remember your coat needs to be generous sized to wear over those loose tops. So a poncho or cape might be a good idea. Add scarves, socks, jewellery, a hat. . .
‘This year’ shoes : ankle boots or decorated ballet flats. Eileen Fisher also has mid-heeled pumps and wedge heel sandals. ‘This year’ bag/ purse : a duffle bag or big clutch. Oversized clothes cause problems for shoulder and cross body bags. They need very long straps so the bag hangs at low hip/ thigh level – not a flattering spot to emphasise for many of us. 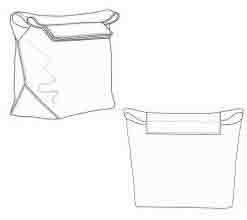 Duffle bag and clutch are easy shapes to make your own patterns for, if you have a little experience with bag making. Studio Kat Cordicella duffle bag. Hot Patterns Out to Lunch clutch. Eileen Fisher has a clutch in suede. There are several BMV patterns for smaller clutches, if a big bag/ purse isn’t a flattering proportion for you, or you prefer a small bag for parties. And you haven’t got to wear red, black, grey – extra important to wear flattering colours on special occasions! What is your key to special festive wear ? It’s probably obvious from my comments that for me it’s the quality of the fabrics. How about lots of extra embellishment ? exuberant use of fabric ? or wild colour ? is a skirt essential ? or a very close fit ? bare skin ? heaped-on bling ? 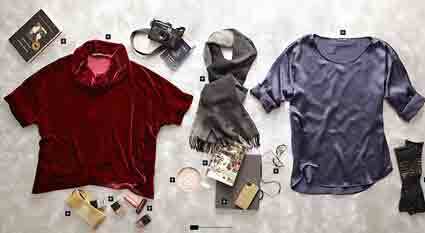 These are casual partying clothes for the 2012 winter holidays, from Eileen Fisher’s Holiday Tool Kit. Some quite easy makes for a relaxed special occasion capsule. As usual this got much too long, so I’ve made 2 parts : this on the tops and pants, and a later piece on the dresses (here). So, what about patterns ? The tops are all based on the casual dartless block. But if you’re full in front, you may want to add a dart. 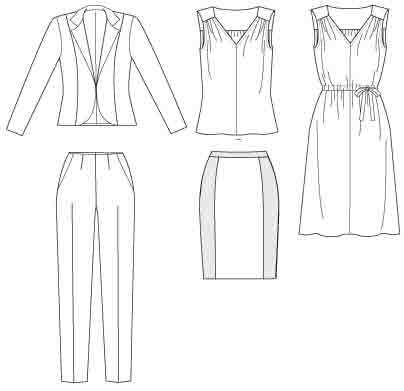 Some lengthening or shortening of pattern pieces needed to match the inspiration (even a couple of changed necklines), but otherwise the patterns are straightforward. What Eileen Fisher calls a ‘box top’ is like a poncho with side seams, very wide. This one is about hip length. And has about elbow length sleeves. With the very generous size, the side seams and armholes come about half way down the upper arm. The key to party wear here is to make everyday over-sized casual styles in special fabrics. The indoor poncho-like McCall’s 6603 has about these proportions. 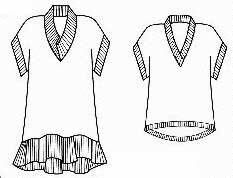 Make the collar on View A (upper left) continuous and wider, and use the lower left sleeves. Or there’s the Sewing Workshop Hudson top – in your usual size or one larger, and shorten the sleeves. 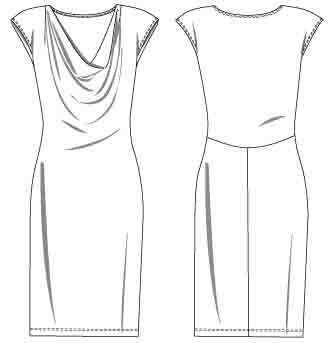 If you prefer something less dramatically sized, there’s Butterick 5816, with a choice of cowl or draped necks. If you prefer a close fit, here’s a cowl neck knit top from Katherine Tilton, Vogue 8793. A little narrower and longer than the previous top, but otherwise much the same. The sleeves also end at the elbow, but are longer because the body of the top is a narrower. This is a shiny knit fabric, with a contrast texture rib band used for the sleeve cuffs. I think this would work just as well in a heavy satin fabric. Perhaps crepe backed satin so you can use the contrast. There are multi-fabric versions of a shape like this in new Butterick 5855. Or use another size of the previous pattern. This is still a style based on a casual dartless block. Many casual wear patterns can easily be adapted for party wear simply by using party fabric, a party neckline, and elbow length sleeves. Katherine Tilton’s loose tunic for knits Vogue 8690 could look very different in shiny fabric with a ballet neckline. 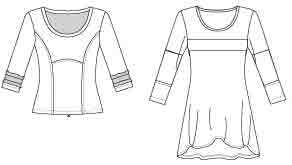 Cutting Line Designs 2×4 includes both necklines. Have a look at my post on stylish sweatshirts for more pattern options. 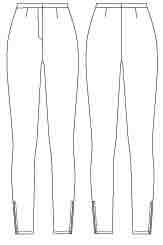 Upper thigh length, with over-wrist long sleeves. A conventional tunic in silhouette. Still a dartless shape, but not so oversized. Raglan sleeves. Difficult to see on the photos, but the sleeves have an inset strip of slightly more open weave fabric which runs from neckline to wrist. 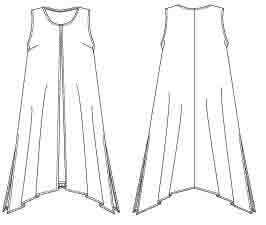 For a pattern, possibly lengthen Butterick 5679 View C and omit the side pocket section. Or Kwik Sew 3954 is another raglan sleeve choice, this one with fitted upper body and flare below, if that’s better for your body shape. Not exact copies of the inspiration but in similar style. Katherine Tilton’s Vogue 8748 big shirt for wovens is even more over-sized, with ‘armhole’ seams at elbow level. Many variants possible. Omit the cuffs and/ or the collar. Close the front opening, and add your most flattering party neckline. Loose fitting knit tunics from Alice + Olivia, Vogue 1261. With raglan, fitted and cut-on sleeves, choice of necklines and hem shapes – just the thing. Or slimmer-fit knit tunics from Katherine Tilton Vogue 8817 with interesting seam detail and fabric combining. Large tops are best worn with slimmer pants, so your clothes don’t make you look gigantic. Make the tops long enough to cover your hips, so you can wear pant legs slimmed as far as they will go for you, without worrying about what’s happening at hip level ! My lumpy legs are not good in tight fitting leggings, but slimmer pants are possible. For stretch knits, you might use McCall’s 6173 View A. Use an elastic waist if you prefer – no one’s going to see it under these tops. If you prefer stretch woven for pants, there’s Melissa Watson’s McCall’s 6405. Would any of these tops make a good relaxed special occasion outfit for you ? Or make all three tops and the pants for a holiday season capsule, covering most situations where you don’t need to be really dressed up. Add a long slim skirt or very full palazzo pants and you might manage many black-tie events too. If you’d prefer to copy Eileen Fishers’ simple dresses, I have another post coming on them. There’s a party clothes sew along at Stitchers Guild, if you’d like some other ideas ! These wide boxy shapes are definitely not everyone’s best shape or favourite style. Perhaps you have other favourite casual patterns you could make in festive fabrics. And clothes based on the casual dartless block are not fashionable “body con” party wear. If you’re at your best in a more fitted styles with body shaping, there’s plenty of choice in the pattern catalogues. If velvet and shine don’t make you happy but you do like variations in texture : lace, sequins, brocade, and touches of fake fur are current festive options. Or these ‘this season’ prints can be good for parties : chinese, baroque, flowers on a dark background, computer generated abstracts. Eileen Fisher uses a current berry shade of red, with black and grey. Happily if we make our own versions we can choose her shapes but aren’t limited to her colours. Especially if we have warm-toned personal colouring. Choose flattering colours that make you feel festive. 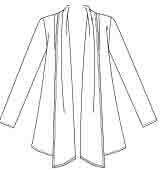 Remember Eileen Fisher clothes are usually very simple in cut. It’s the quality of the fabrics that makes them luxurious. 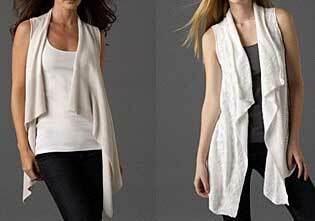 Eileen Fisher’s designs for the coming season have appeared. The ‘system’ for ‘dress in 5 minutes’ is very similar to last year, when I wrote several posts on it. So renew your basics. 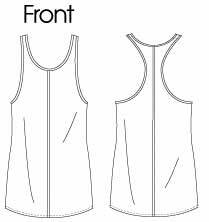 Mostly low hip length sleeveless tops with wide or narrow straps (see previous ‘dress in 5 minutes’ tops post). One new style element – a ‘racer-back’, see McCall’s 6288 by Rebecca Turbow. A few thigh length tunics, one with sleeves (see winter capsule post for pattern suggestions). And slim pants – though there is a choice of straight and wide legged pants in the main catalogue. Just-above-knee length slim straight skirts. Eileen Fisher hasn’t chosen to go for this season’s trendy longer looser skirts. 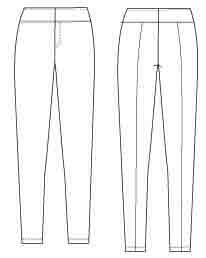 See previous ‘dress in 5 minutes’ bottoms post for slim pant and skirt patterns. There aren’t any layering pieces in the ‘dress in 5 minutes’ section this time. But there are plenty of possibilities elsewhere in the catalogue. Several main shapes keep appearing (jackets I’m putting in a separate post). Many knit cardigans. Similar styles to previous layering tops. – short straight little tops, as last summer. Easiest to find find patterns for these little jackets/ shrugs in the evening wear pattern sections, perhaps McCall’s 6245 below (or Butterick 5529 View C.). There are some comments on wearing these short layering pieces in my previous post on ‘dress in 5 minutes’ layers. Many Eileen Fisher versions of these, in different fibres and with slightly different fronts. Also many patterns. A typical one is McCall’s 6084. Some other patterns in my winter capsule post. 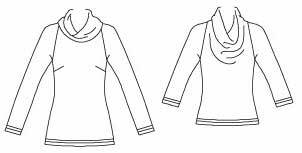 Add one of these wide curved V-necks to a favourite easy fit knit top pattern. 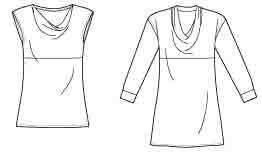 As well as open V-necks, you can add cowl and drape necklines. 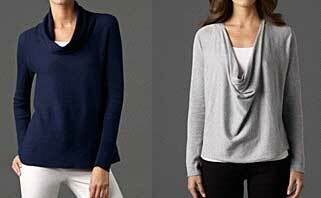 Eileen Fisher call styles with an added fabric piece ‘cowls’, and styles with an integral dropped front ‘draped’ – perhaps cut on the bias. There are several patterns for these in the catalogues, though not many with long sleeves. Try Vogue 8597, which has both cowl and drape neck versions. Some pattern suggestions in my ‘current vests’ post. 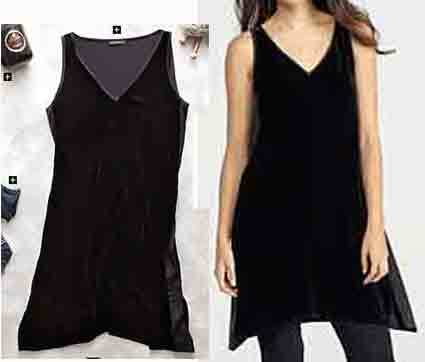 As usual, most of the Eileen Fisher dresses are simply longer versions of the sleeveless tops. There is one shirt dress, the only dress with sleeves. And there are a couple of classic shirts in the Tops section. 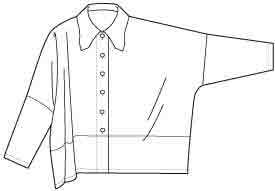 Several patterns for classic shirts. Palmer-Pletsch McCall’s 5433 has fitting help. This pattern combines a classic band shirt collar with 4 sleeves and 3 lengths, and could easily be lengthened to a dress. You may be going for shirts because you prefer wovens to knits. Or if you can’t find knit fabrics you like. You can of course make all these top, cardigan, ‘sweater’ and vest shapes in wovens. Possible patterns in the other posts I’ve linked to. Big slouchy leather bags (Vogue 8680). There’s currently a good video on ways of wearing scarves, in the videos section of the Eileen Fisher site. Many continuing styles. So if you stocked up in previous seasons, on sleeveless tops, simple slim bottoms, and knit loose layers, you can continue to wear them. It’s interesting fabrics and surface textures plus subtle details which give variety to the main shapes. There’s a good video showing some of the details and looks, a Spring Preview currently on the Eileen Fisher site. There are several focus jacket shapes, so I’m planning more posts on those. Eileen Fisher mainly uses black and greys. There are many other current colours and prints if you prefer them, see my post on looks for the coming summer. The top runway designers tempt the big spenders by changing the fashion shapes every season. Pants seem to be the current most rapidly changing high fashion shape. But you haven’t got to change your clothes so much to look good (which is rather different from looking fashionable :D).